It is considered America’s National Pastime, but far more than just a mere sporting event, baseball has become a major part of the American consciousness. During war, following natural disaster, or in the midst of economic hardship, this game has always provided an emotional escape for people from every race, religion and background who can collectively find solace at the ballpark. Therefore, it somehow seems fitting that the origins of modern baseball can be traced back to a divided America, when the country was in the midst of a great Civil War. 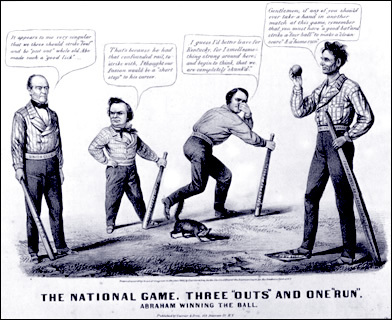 Despite the political and social grievances that resulted in the separation of the North and South, both sides shared some common interests, such as playing baseball. Very little documentation exists regarding these games and most information has been derived from letters written by officers and enlisted men to their families on the home front. Of the hundreds of pictures taken during the Civil War by photographers, there is only one photo in the National Archives that clearly captured a baseball game underway in the background. 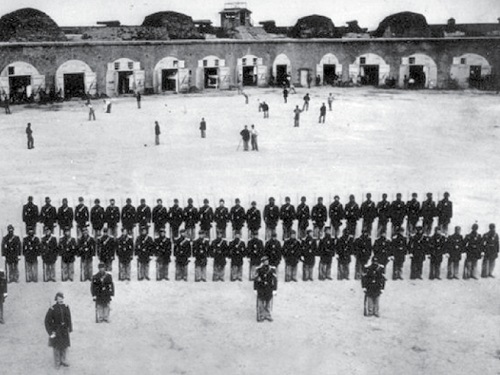 The image was taken at Fort Pulaski, Georgia and shows the “original” New York Yankees of the 48th Volunteers, playing a game in the fortification’s yard. Several newspaper artists also depicted primitive ballgames and other forms of recreation devised to help boost troop morale and maintain physical fitness. Regardless of the lack of “media coverage,” military historians have proven that baseball was a common ground in a country divided and helped both Union and Confederate soldiers temporarily escape the horror of war. 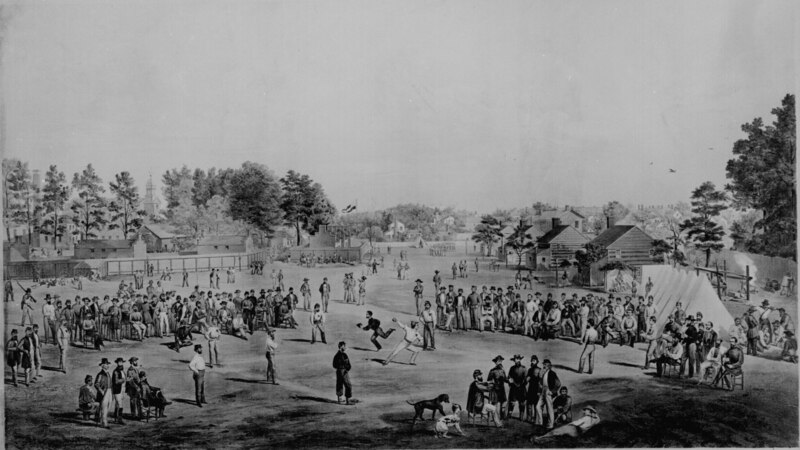 Army encampments were not the only locations to host “Town Ball” games. Prisons also held them as POWs struggled to escape the hopelessness of their situation and combat the mind-numbing boredom that confronted them each day. One such institution was Salisbury Prison, located in North Carolina. The compound was established on sixteen acres purchased by the Confederate Government on November 2, 1861. The prison consisted of an old cotton factory building measuring 90×50 feet, six brick tenements, a large house, a smith shop and a few other small buildings. Although a primitive form of baseball was somewhat popular in larger communities on both sides of the Mason-Dixon Line, it did not achieve widespread popularity until after the start of the war. The mass concentration of young men in army camps and prisons eventually converted the sport formerly reserved for “gentlemen” into a recreational pastime that could be enjoyed by people from all backgrounds. For instance, both officers and enlisted men played side by side and soldiers earned their places on the team because of their athletic talents, not their military rank or social standing. Both Union and Confederate officers endorsed baseball as a much-needed morale builder that also provided both mental and physical conditioning. After long details at camp, it eased the boredom and created a team spirit among the men. 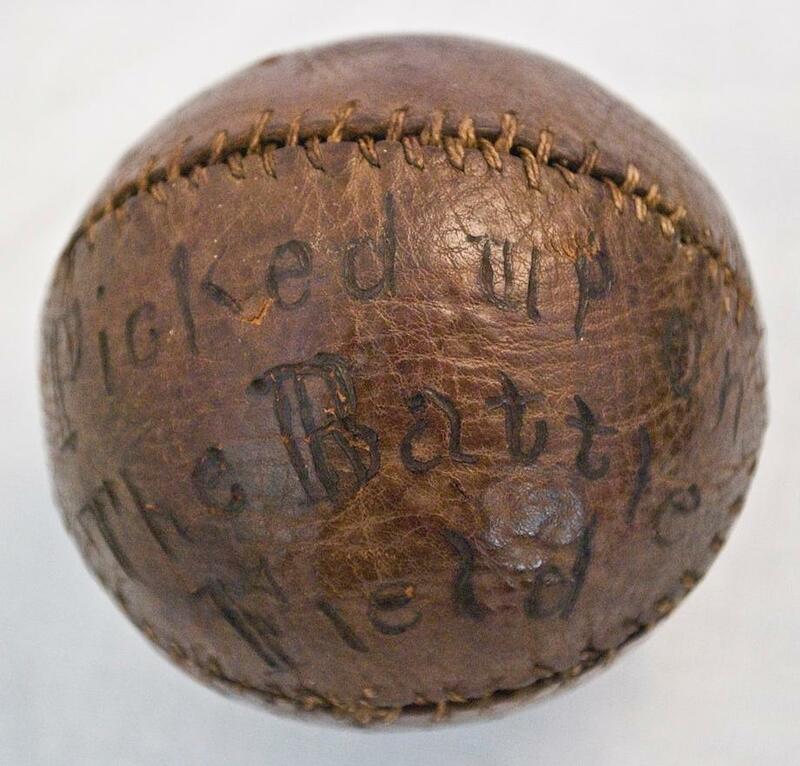 Some soldiers actually took baseball equipment to war with them. When proper equipment was not available they often improvised with fence posts, barrel staves or tree branches for bats and yarn or rag-wrapped walnuts or lumps of cork for balls. The benefits of playing while at war went far beyond fitness, as often the camaraderie displayed on the baseball diamond translated into a teamwork mentality on the battlefield. Many times, soldiers would write of these games in the letters sent home, as they were much more pleasant to recall than the hardship of battle. This was perhaps one of the earliest forms of sports journalism and the precursor to the “box-score beat writers” of the 20th century. Michael Aubrecht is an author, as well as a Civil War Historian. He has written several books including The Civil War in Spotsylvania and Historic Churches of Fredericksburg. Michael was also a contributing writer for Baseball-Almanac from 2000-2006. He lives in historic Fredericksburg. Visit his blog online at https://maubrecht.wordpress.com/. J.G. Adams, Reminiscences of the 19th Massachusetts Regiment (Boston: Wright and Porter, 1899). Patricia Millen, From Pastime to Passion: Baseball and the Civil War (Heritage Books, January 2001). This entry was posted in Armies, Common Soldier and tagged Alpheris B. Parker, American Baseball, Baseball, Civil War Baseball, Fort Pulaski, George Putnam, Prisoners, Salisbury Prisoner, Town Ball. Bookmark the permalink. I have written about this so many times–it is a topic I love dearly! It is wonderful to see so many reenactors include a ball game in the mix of the weekend activities, and watching teams play old time baseball is a treat as well. When we were in Wisconsin, we made sure to hit the sights where “League of Their Own” was filmed. If anyone ever has a chance, google up “old-time baseball” and see if you have a league near you. Our area just added a new team from San Jose to the schedule this year. Huzzah!